The first time I’d heard of quinces was in a cookbook. At the time, I had no idea what they were. They aren’t popular (or really present) on the east coast. They seemed suitably exotic until I looked at the front of the cookbook (what? you think I normally read all that useful information in the front first? why would I do a thing like that?) and realized there was a picture of them. And they looked like apples which are about as un-exotic as one can get. A few weeks ago, while wandering through our local farmer’s market, I spied some quinces for sale. Given that they looked like apples, I figured they wouldn’t be that difficult to utilize (which is a word that you aren’t supposed to use as it’s considered jargon and can easily be replaced by the word “use”). And then they sat in the refrigerator for several weeks (I can’t be the only one out there to do that). When we were in San Francisco, I actually had an apple and quince tart at the Chez Panisse Café so I had some idea of what they tasted like (sour). Unfortunately, the cookbook that the recipe is promised to be in hasn’t shown up at our local Costco yet (even though they claim it’s for sale). So making the apple and quince tart was out and it appears that the only thing anyone else makes with quinces is quince paste. Calling it a paste is a misnomer. When I think of paste, I think of the stuff that kindergarteners like to eat. This is much closer to gummy bears. 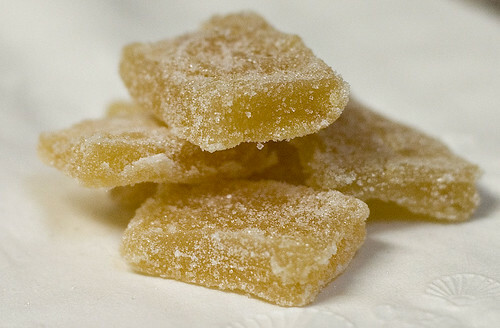 Or maybe crystallized ginger. But not paste. To me, they taste like a sour apple gummy bear. Angela’s advice is to not drink Coke Zero immediately prior to eating a quince paste candy (apparently it then tastes like medicine). You could also make a good quince sauce by not cooking the puree completely. Wash the quinces in running water. Cut the fruit, unpeeled, into 1-inch cubes. Combine the quinces, water, and lemon in a sauce pan. Cook, covered, over medium heat for 1 hour to 1 hour 15 minutes, or until the quinces are soft. Drain the quinces and discard the lemon. Run the quince through a food mill fitted with a medium disk. Combine the quince puree and the sugar in a large skillet. Cook at a low simmer for 30 to 40 minutes. The paste should become thicker over time. It’s done when it has a consistency similar to honey. Prepare a rimmed baking sheet by placing a layer of parchment paper on it. Spread the quince paste across it, about 1/2 inch thick. Allow the quince paste to cool completely and harden slightly. Cut the quince piece into 1 inch squares. Roll the cut pieces in granulated sugar. Store in an unsealed container. Quinces were massively popular in the Middle Ages, and they still figure prominently in cooking in the Mediterranean. One of my favorite recipes is the Turkish Avya Yahnisi, a lamb and quince stew. Qunce has the odd characteristic of improving in texture (becoming stronger and denser) and changing color (from yellow to pink) as it cooks. So don’t stop with the paste. It’s a delightful fruit that adds a crisp, bright note to recipes. The picture of your quince paste speaks volumes. Yum. And it’s a recipe I’ll have to try soon. I have the book, but had forgotten all about this little treasure. Thanks Matt. I just read your post about the quince paste. Interestingly enough I just came across a recipe for the same thing although it was called Quince Cheese. I thought it was an unusual term since it really wasnt cheese- there was also a recipe for Damson Cheese ( made out of plums ). 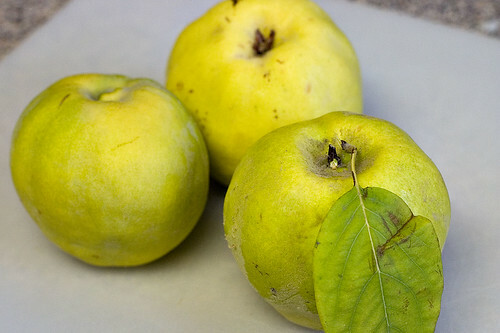 I plan on making this recipe in the next week or so with the quinces as I have just started using quinces this year and find the flavor very interesting. Yours looks like it turned out perfect…wonder how long of a shelf life it has? Did you refrigerate yours? Jennifer – I haven’t refrigerated mine. They’re currently sitting on my desk at home. As far as I can tell (and by my guess), they should last for nearly indefinitely. It’s basically quinces preserved in sugar. Most of the liquid has already been cooked out. The main thing mentioned by the cookbook was that they should not be kept in an air tight container because they’ll become soggy. Right am immediately borrowing this recipe. As a total garden dunce I’m intrigued by the idea that both apples and quinces are from the rose family. Having tasted the quince jellies, do you think they could take a dash of rose water? I’ve never actually had rose water (where is such a thing sold?) so it’s hard for me to tell. It probably wouldn’t be bad. However, the key is to cook out pretty much all of the liquid so I don’t know how much rose essence would be left. Here in Spain we eat the jelly with cured cheeses. It’s a marriage made in heaven! Rose water is most commonly available in stores that cater to Indian, Turkish, or North African populations. It’s an indispensable ingredient in a lot of desserts in particular. One of my favorite summer desserts is Moroccan orange salad with rosewater and cinnamon.